The Count Down for Roland Garros has begun! “A win for Rafael Nadal at this year’s French Open would see him equal Björn Borg’s record of six Roland Garros crowns, at virtually the same age. Not that the Majorcan – such a dominant force on clay – is taking anything for granted however. Roger Federer is one of the best players in the history of tennis, but the two all-time greats of our sport are Rafael Nadal and Björn Borg.” Thus spake John McEnroe – a man who knows a thing or two about tennis, it has to be said. The outspoken American player-turned-commentator has never shied away from controversy, but he is very much an expert in his field. The two greats he refers to certainly have a lot in common – both men tasted success at an early age and soon went on to dominate their sport, nowhere more so than at Roland Garros. The Swede secured a record six titles before his 25th birthday, and only one man got the better of him at The French between 1974 and 1981 – Italy’s Adriano Panatta. 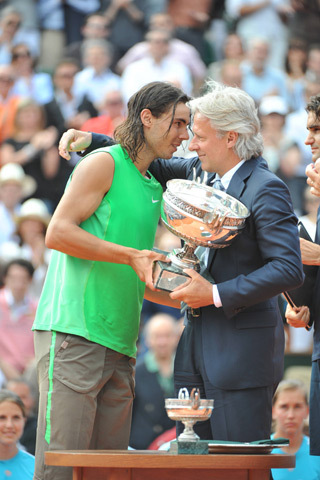 Likewise, Nadal has only once tasted defeat on the Paris clay, going down to Robin Söderling in 2009. And should Rafa win the title again this year, he will equal Borg’s record mere days after his own 25th birthday, which he will celebrate on 3 June just as the tournament is heading towards the business end. In a certain sense Nadal could outdo Borg this year, since it took the Swede eight attempts to win six French Opens. At this, his seventh appearance at the Paris major, Nadal will be the red hot favourite, though he currently has his own lofty standards to live up to. Last season he swept all before him during the spring, securing the first ever “Clay Slam” by winning the three ATP 1000 Masters tournaments on this surface followed by Roland Garros. Is Djokovic going to win French Open this year…No he´s not the winner in the end even if he looks strong? 37 wins in a row…that´s something…the record is obviosly 43 matches in a row…BUT…in Paris…no way he stands as the winner last Sunday in French! So do you think Nadal is the winner or who? Is there any upcoming players this year?